For a one-page printable version of these instructions, click on the Chocolate Brush Strokes recipe page. Chocolate Brush Strokes are an easy chocolate decoration that adds a beautiful touch to cakes, tarts, and cupcakes! You can make as many or as few as you'd like, but as a rough guide, plan on getting about a dozen from 4 oz of chocolate. If you want to use real chocolate, temper it following these instructions. If you want to use chocolate candy coating, place it in a microwave-safe bowl and microwave in 30-second increments, stirring well after every 30 seconds to avoid overheating. 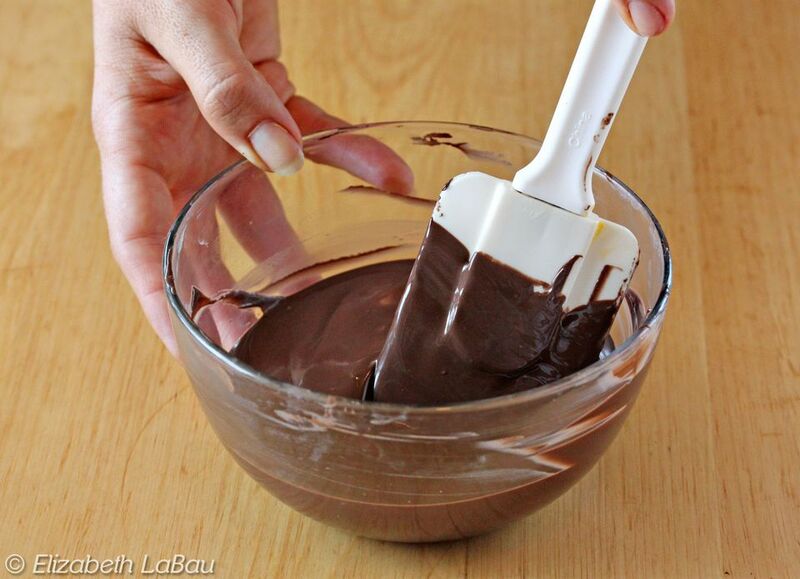 Dip a clean, dry pastry brush in the melted chocolate or coating. Brush a stripe of chocolate about 2-3 inches long on the baking sheet. As you get toward the end, the chocolate will get spotty and you'll see an uneven edge along the top—that is great! That's what makes it look like a brush stroke! If the chocolate layer looks thin or translucent, dip the brush back in the chocolate and go over the original brush stroke a second time to make it thicker. Repeat until all of your chocolate is used up, or you have as many decorations as you need. They are a little delicate, so it's a good idea to make a few extras in case of breakage. Refrigerate the tray for about 10 minutes, to set the decorations. Once set, carefully lift them from the tray by sliding a spatula under them, then gently lifting them up with your fingers. Chocolate Brush Strokes can be used to decorate cakes, tarts, or cupcakes. I love to rest them up against truffles on top of cake, but they're also lovely when perched on top of frosting or whipped cream rosettes. You can also try tiling them around the sides of cake so that the sides are completely covered. Your brush strokes are now finished! If you don't want to use them to decorate right away, they can be stored in a cool location in an airtight container for several weeks. Avoid stacking them on top of each other--place layers of parchment or waxed paper between them. Enjoy!